With Georgia tax receipts down by over $2 billion, the Georgia’s Hope Scholarship program dipping into its reserve fund, and public schools furloughing teachers to save money, I am happy to learn that the state legislature spent some time debating a truly monumental problem – the tough choices faced by drivers who run over a deer or a bear. Senate Bill 474 was passed by the 2010 Georgia legislature. It allows drivers to keep any bear or deer they might run over. Previously, such roadkill had to be scraped off the roadway and given to the Department of Natural Resource, where the carcasses were stuff, mounted and installed in various state owned properties. Apparently the DNR has run out of places to mount the roadkill. Perhaps the state taxidermists were also furloughed. I suppose all those pesky budget issues can wait until next year. 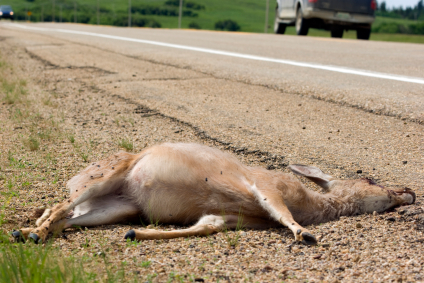 No word on whether restaurants using roadkill will have to disclose same on their menus. Judge Andrew Napolitano offers a cogent take on how Congress has expanded the scope of the Commerce Clause far beyond anything contemplated by our founding fathers. How any American can approve of the overreaching nature of our federal government is beyond understanding. Like the frog that gets boiled alive in a pot of gradually heating water, our civil, economic and personal liberties are being taken from us by the controlling nanny state. Saturday Night Live Takes Aim at Obama!!! I never thought I would see the day when a reliably left network like NBC would allow a cynical (well, maybe not exactly biting) skit to open its popular Saturday Night Live. But here it is – cast member Fred Armisen portraying a bumbling Barack Obama reassuring his critics that they should not fear him because he has done “nothing” since taking office. Collection and disclosure of information: To ensure we are able to communicate effectively with visitors to our web site, we collect some information that can be directly associated with a specific person. We call this “Personal Information,” and it includes, by way of illustration, names, addresses, telephone numbers and e-mail addresses. Regardless of where you stand on the health care debate, we should be able to expect a modicum of honesty from our elected representatives. In this clip, White House spokesman Bill Burton refuses to answer a simple question – is the White House keeping the names and email addresss of individuals writing into express concerns about the president’s health care reform proposals. Clearly the White House is keeping lists, which is not necessarily a surprise. It is certainly easy enough to create a “disposable” email address if you do not want your identity discovered easily.